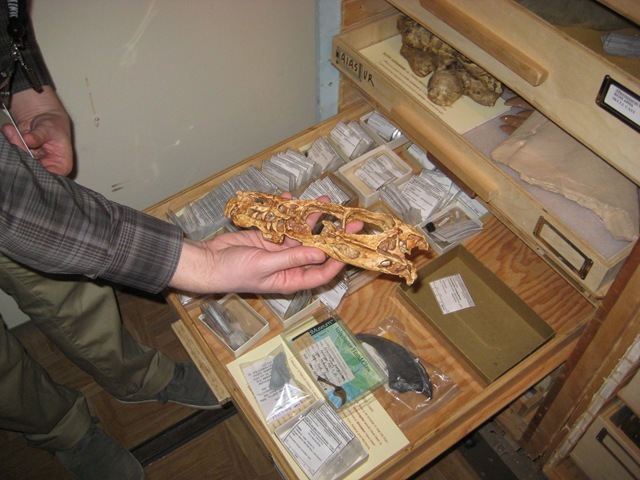 Paleontologist and ROM Curator David Evans… and DINOSAURS! 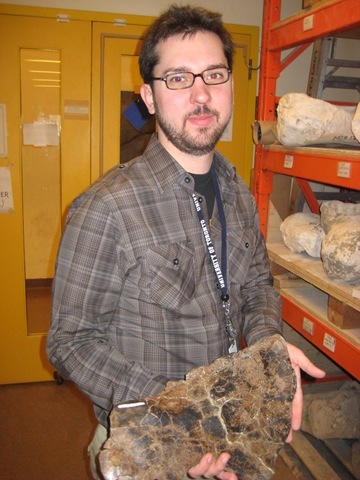 David Evans is the associate curator in vertebrate paleontology at the Royal Ontario Museum (ROM). So basically he has the job that every single eight year old would die for. He oversees dinosaur research at the ROM, travels the globe looking for dinosaur bones – from the Arctic to Africa to Alberta – and meets with researchers at the world’s best museums. He is about to leave for a five week trip to Northern Sudan to search for dinosaur remains. So I was really glad we could find time for this lunch before he left. Oh and he took me on a behind-the-scenes tour of the dinosaur collection at the ROM and it was THE BEST DAY OF MY LIFE!!! 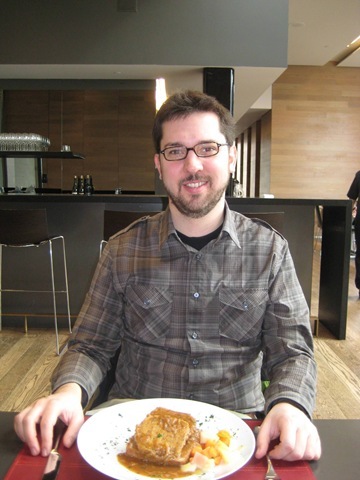 We ate at Jamie Kennedy at the Gardiner – a café on the 3rd floor of the Gardiner Museum. It’s a great space. While we were there, a couple was getting a tour for their upcoming wedding. I can see how this venue would be awesome for special events. I had the layered vegetarian sandwich, David had the meatloaf sandwich and we split fries. The food was light and tasty and very fresh. We both drank water. Total bill was $27 with tax. So it turns out that Dr. Alan Grant was right. Birds are dinosaurs. David explained to me that birds share much of the same genetic make-up as dinosaurs and in fact (I am likely not explaining this in the correct scientific terms) have the ability to have tails, hands and teeth but those features have been turned off within their genomes. Then he gave me a great lesson. Picture a chicken. Now take away its feathers, put a tail on it, put teeth in its mouth and add little hands to the ends of its arms. It would totally look like a little dinosaur. Amazing. Dinochicken. I usually don’t publicly talk about my upcoming lunches or tell others who I am taking out just incase it falls through. But with this lunch, I could not shut up about it. I had a countdown on Twitter. I pretty much told everyone that would listen – to the point that I think people were getting sick of me. And the lunch did not disappoint. We’ll get to the actual behind-the-scenes tour in a bit. David talked to me about how he actually finds dinosaur bones. He said it’s not all about digging like you see on TV, it’s really about walking. For his upcoming trip, he is traveling with a German group of dino-trackers and they will be walking in the desert in Northern Sudan and just looking at the ground, at mountain sides and everywhere around them for fragments of dinosaur bones sticking out. Isn’t that insane? 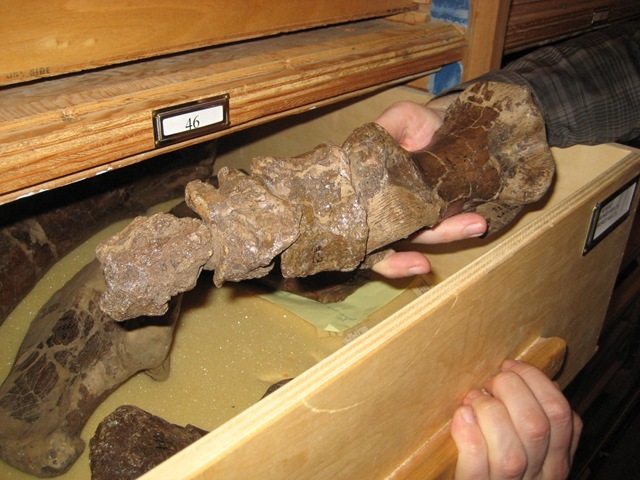 After 75 million years, there could still be a dinosaur bone sticking out of the ground. Anyway, they will see a tiny fragment and examine it and what may be around it. Then, if further exploration is needed, the team will arrange to do the exploration with the heavy equipment on another trip. I did talk to David about how every kid goes through their dinosaur phase where they are just fascinated by everything to do with dinosaurs. 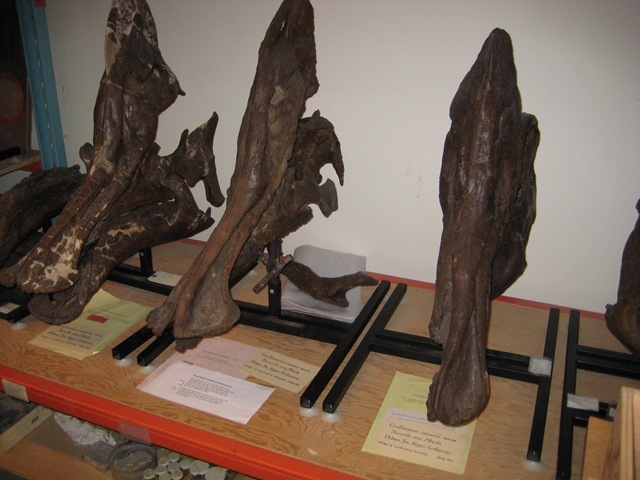 I think it’s so awesome that he continued that interest and now works with dinosaur bones every day. He says he knew he wanted to do this for as long as he can remember. He also said that dinosaurs are a great introduction for kids to science. Even if they don’t end up pursuing a career in paleontology, it’s great that they’re interested in and loving science. I also had to ask David what killed the dinosaurs. He said it is a matter of fierce debate within the scientific community. He did say that it seems that an asteroid did hit the Earth and this took out many of the dinosaurs. However, he doesn’t believe this was the only factor and says it was a combination of things and didn’t just happen in one big bang. Never in a million years did I think when I started this blog that I would get to do something as cool as taking David out to lunch and holding 75 million year old dinosaur remains. I haven’t been to see the dinosaur exhibit since I was a kid and I really did feel like a kid again. It was such an amazing day and a big thanks to David for giving me so much of his time. The tour started with David taking me into the room that people don’t get to see. 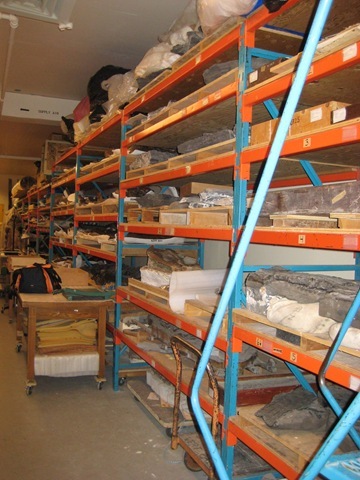 It houses over a million dinosaur bones and fragments. 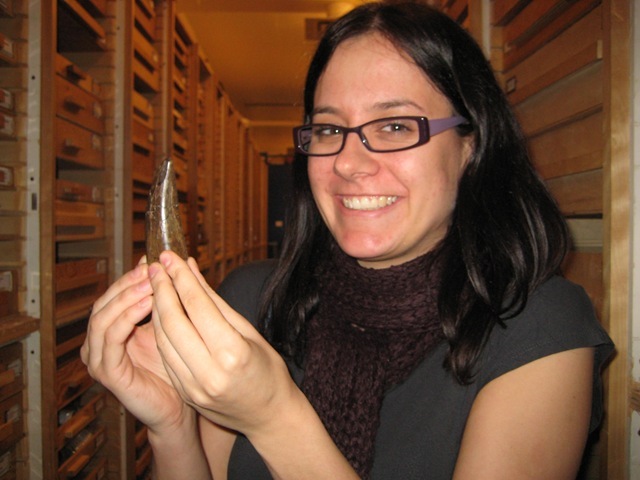 Me holding a 75 million year old dinosaur horn – Look how excited I am! A part of a dinosaur skull. 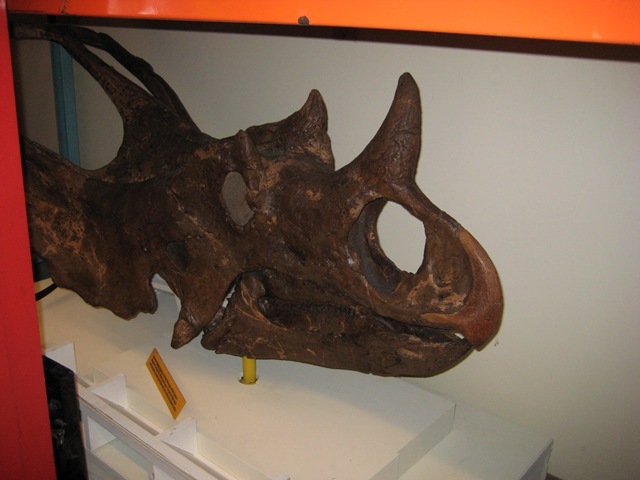 This particular dinosaur used his head as a battering ram – look how thick it is! Wouldn’t want to bump into this guy in a dark alley – Roaarrrrr! 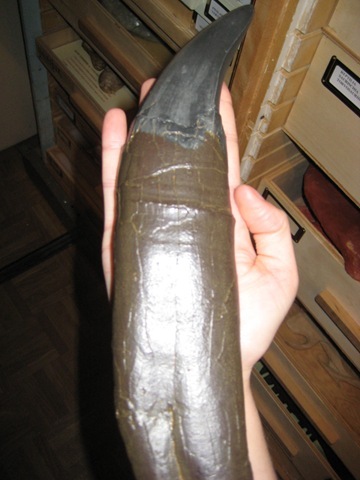 Coolest pic of all – a Tyrannosaurus Rex tooth! Look at that thing! And its edge is serrated like a steak knife. 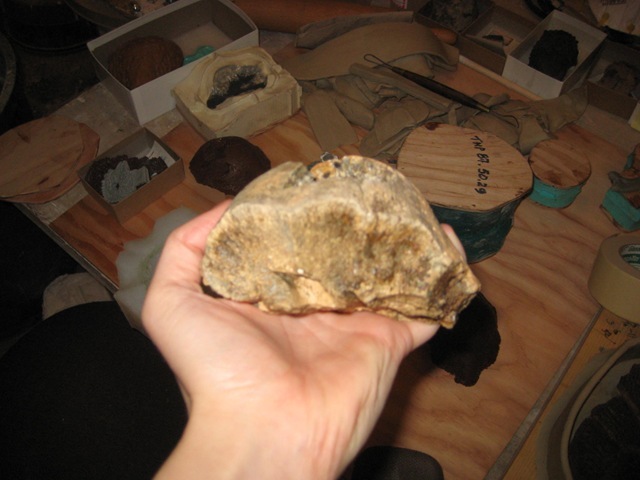 Part of a raptor’s skull. David let me know that they were A LOT smaller than they were portrayed in Jurassic Park. Raptors were only 2-3 feet high, who knew? Totally cool!! You are soo lucky. Great post. Maybe my favorite so far. Awesome experience. “Amazing. Dinochicken.” and “Wouldn’t want to bump into this guy in a dark alley – Roaarrrrr!” had me laughing out loud. Nice work! It’s so amazing that you got the behind-the-scenes tour included!! Awesome. What an incredible opportunity. What I loved most about your post is how excited you are. Not many people stay that excited about dinosaurs into adulthood – count yourself lucky! When my daughter turned seven we found a real paleontologist to come to her birthday party and show the kids the fossils he’d found in Montana, excavate for shark teeth, etc. She’s been obsessed with dinosaurs for five years. Her favourite dino is a spinosaurus and he gave her a 95 million year old spinosaurus tooth as a present. Just like you, it was the best day of her life. I am glad that others thought this experience was as cool and exciting as I did. I felt like a giant dork writing about how excited I was…. but I was that excited. Nerd Alert! What an amazing opportunity! I love the ROM exhibit and would LOVE to see that backroom. Who knew Raptors were that small?! Seriously crazy. Did they have feathers too? I had heard that before. Totally cool! 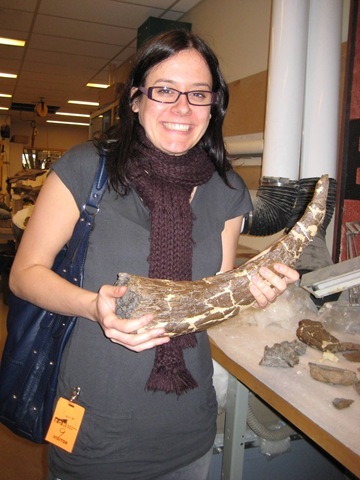 I love the picture of you holding a dinosaur bone. That should be a permanent fixture on your front page.